ItemC-04894 - Herbert J. Hillier. ItemC-04908 - Mrs. Alice Crakanthorp, the first white girl born on the west coast of Vancouver Island; revisiting her school days. ItemC-04910 - Loggers' bunkhouses; believed to be either Myrtle Point or Franklin Creek. ItemC-04911 - Logging cam dining room; believed to be either Myrtle Point or Franklin Creek. ItemC-03213 - "102 R.M.R. Kamloops, BC, Commemoration Day Aug 4, 1915"
ItemC-03227 - Mail car and baggage car completely covered by a snow slide. ItemC-03229 - Digging out engine 2702; top rear corner of tender showing. ItemC-03230 - One side of engine 2701 and rear of tender cleared of snow. ItemI-32907 - The SS Twickenham aground on San Juan Island. Item C-03213 - "102 R.M.R. 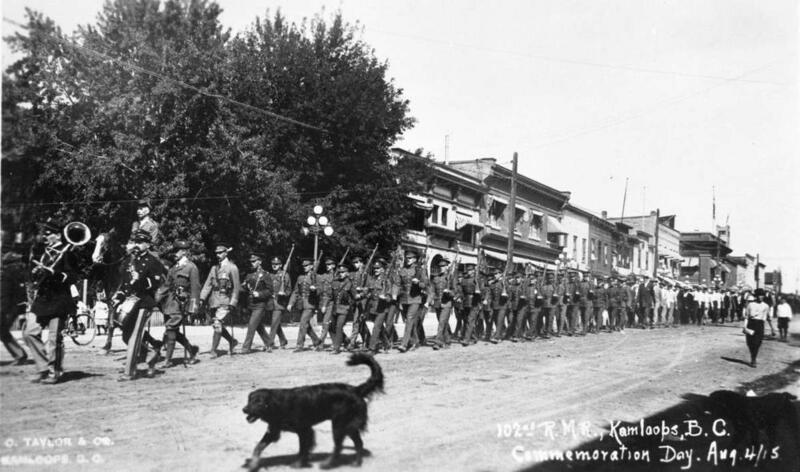 Kamloops, BC, Commemoration Day Aug 4, 1915"
102nd Regiment, Rocky Mountain Rangers.